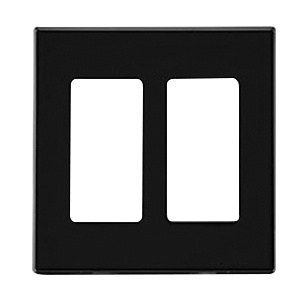 Leviton Decora Plus™ 2-Gang Standard size screwless wallplate/faceplate in black color, features polycarbonate construction with smooth finish. Square wallplate/faceplate measures 4.56-Inch x 4.5-Inch x 0.220-Inch. It is perfect for use with a dedicated sub-plate for fast and easy installation. Snap-on mountable wallplate/faceplate with two decora configuration, has 0.406-Inch x 0.942-Inch cutout. It is suitable for use in commercial, industrial, institutional and residential installations. Wallplate/faceplate is ETL listed.